Together, James Patterson and Joey Green have created a rollicking new middle grade novel that is a hilarious adventure into a futuristic world, where different is dangerous, imagination is insanity, and creativity is crazy! Norbert Riddle lives in the United State of Earth, where normal means following the rules, never standing out, and being exactly the same as everyone else, down to the plain gray jumpsuits he wears everyday. He's been normal his whole life—until a moment of temporary hilarity when he does a funny impression of their dictator, Loving Leader . . . and gets caught! 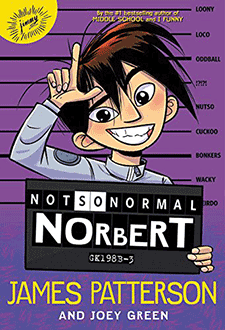 Now, Norbert's been arrested and banished to planet Zorquat 3 in the Orion Nebula, where kids who defy the rules roam free in the Astro-Nuts camp. Norbert has been taught his whole life that different is wrong, but everyone at Astro-Nuts is crazy, creative, and insane! Norbert wants nothing more than to go back to earth where things are awful but at least they're familiar. But he soon realizes that being different could be better—and maybe the crazy farm is exactly where he belongs after all. Copyright © 2018 Joey Green. All rights reserved.